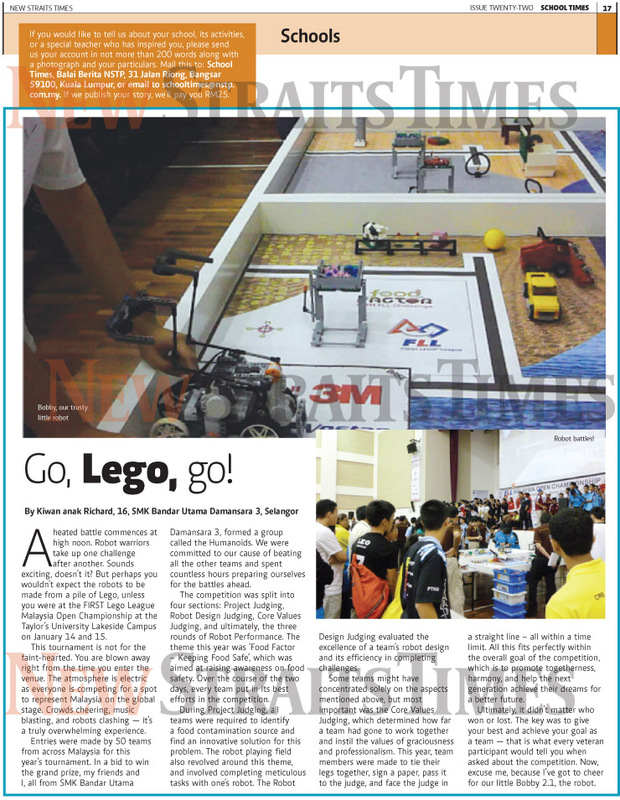 Pusat Sumber SMK Bandar Utama Damansara (3): Highlights of 2012: Go, Lego, go! A heated battle commences at high noon; robot warriors taking up challenge after challenge. Would you expect this from a pile of Lego? Maybe not your ordinary pile, but that’s what it does here, at the FIRST Lego League Malaysia Open Championship at Taylor’s University Lakeside Campus on 14 - 15 January 2012. Once you enter the venue, you’d be blown away by the atmosphere. Crowds cheering, music blasting, and robots clashing, it’s not for the faint-hearted! It’s truly overwhelming; as everyone is competing for a spot to represent Malaysia in the global arena, so it’s no wonder that it is so electrifying. This year, my friends and I formed the Humanoids, in a bid to compete with 50 other teams from across Malaysia for the grand prize. Spending countless hours preparing ourselves, one must be truly committed to reach for the stars. The competition is split into four sections: Project Judging, Robot Design Judging, Core Values Judging, and ultimately the three rounds of Robot Performance. Over the course of these two days, every team would give their all. The theme this year is ‘Food Factor – Keeping Food Safe’, which would raise awareness on food safety. For our Project, all teams are required to identify a food contamination source and create an innovative solution to solve this problem. The robot playing field also revolves around this theme, completing meticulous tasks with one’s robot. The Robot Design Judging would evaluate the excellence of a team’s robot design and its efficiency in completing challenges. A team may concentrate solely on these aspects, but what is most important is the Core Values Judging, which would judge how far a team has gone to work together in instilling the values of gracious professionalism by completing a task together. This year, teams would tie their legs to each other, sign a paper, pass it to the judge and face the judge in a straight line in a time limit. This is the main goal of this competition, to help the next generation achieve their dreams for a better future. It doesn’t matter ultimately, win or lose, but the key thing is to give your all to achieve your goal as a team. That is what every veteran participant would tell you when asked about the competition. Now, excuse me, because I’ve got to cheer for our little Bobby 2.1 the robot….